Many developers use master-slave replication to solve a number of different problems, including problems with performance, supporting the backup of different databases, and as a part of a larger solution to alleviate system failures. As you know master-slave replication enables data from one database server (the master) to be replicated to one or more database servers (the slaves). The master logs the updates, which then ripple through to the slaves. The slave outputs a message stating that it has received the update successfully, thus allowing the sending of subsequent updates. Master-slave replication can be either synchronous or asynchronous. The difference is simply the timing of propagation of changes. If the changes are made to the master and slave at the same time, it is synchronous. If changes are queued up and written later, it is asynchronous. Data security – as data is replicated to the slave, and the slave can pause the replication process, it is possible to run backup services on the slave without corrupting the corresponding master data. Backups: to use replication as a backup solution, replicate data from the master to a slave, and then back up the data slave. The slave can be paused and shut down without affecting the running operation of the master, so you can produce an effective snapshot of “live” data that would otherwise require the master to be shut down. Scale-out: you can use replication as a scale-out solution; that is, where you want to split up the load of database queries across multiple database servers, within some reasonable limitations. Because replication works from the distribution of one master to one or more slaves, using replication for scale-out works best in an environment where you have a high number of reads and low number of writes/updates. Most Web sites fit into this category, where users are browsing the Web site, reading articles, posts, or viewing products. Updates only occur during session management, or when making a purchase or adding a comment/message to a forum. Replication in this situation enables you to distribute the reads over the replication slaves, while still enabling your web servers to communicate with the replication master when a write is required. Spreading the load: there may be situations when you have a single master and want to replicate different databases to different slaves. For example, you may want to distribute different sales data to different departments to help spread the load during data analysis. Increasing the performance: as the number of slaves connecting to a master increases, the load, although minimal, also increases, as each slave uses a client connection to the master. Also, as each slave must receive a full copy of the master binary log, the network load on the master may also increase and create a bottleneck. If you are using a large number of slaves connected to one master, and that master is also busy processing requests (for example, as a part of a scale-out solution), then you may want to improve the performance of the replication process. One way to improve the performance of the replication process is to create a deeper replication structure that enables the master to replicate to only one slave, and for the remaining slaves to connect to this primary slave for their individual replication requirements. Failover alleviating: You can set up a master and a slave (or several slaves), and to write a script that monitors the master to check whether it is up. Then instruct your applications and the slaves to change master in case of failure. Security: you can use SSL for encrypting the transfer of the binary log required during replication, but both the master and the slave must support SSL network connections. If either host does not support SSL connections, replication through an SSL connection is not possible. Setting up replication using an SSL connection is similar to setting up a server and client using SSL. You must obtain (or create) a suitable security certificate that you can use on the master, and a similar certificate (from the same certificate authority) on each slave. Now let’s examine a simple example on how to configure master-slave replication on Jelastic PaaS. *The instruction below is fully suitable for MySQL database servers. First of all we create two environments in Jelastic for our master and slave databases. 3. In the Environment topology dialog pick MariaDB (or MySQL) as a database you want to use. 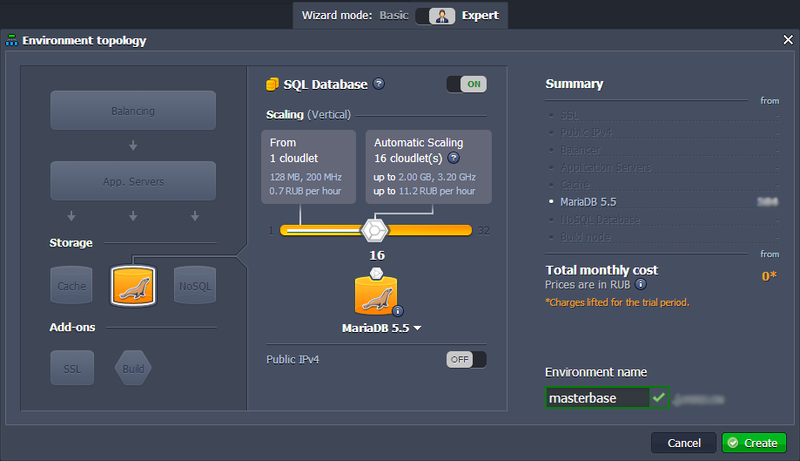 Set the cloudlet limit and type the name of your first environment, for example, masterbase. 4. In the same way create one more environment with MariaDB or just clone it. Let’s name it slavebase. BTW it will be located on the other hardnode, what is even more secure and reliable for storing your data. Now you have two identical environments with two databases. Let’s configure master base now. 1. Click config button for your master database. We use binlog format “mixed” (binlog-format=mixed) to allow a replication of operations with foreign keys. 3. Save the changes and restart MariaDB in order to apply the new configuration parameters. 4. Click the Open in browser button for MariaDB. Jelastic sent you an email with credentials to the database. Log in using these credentials. 5. 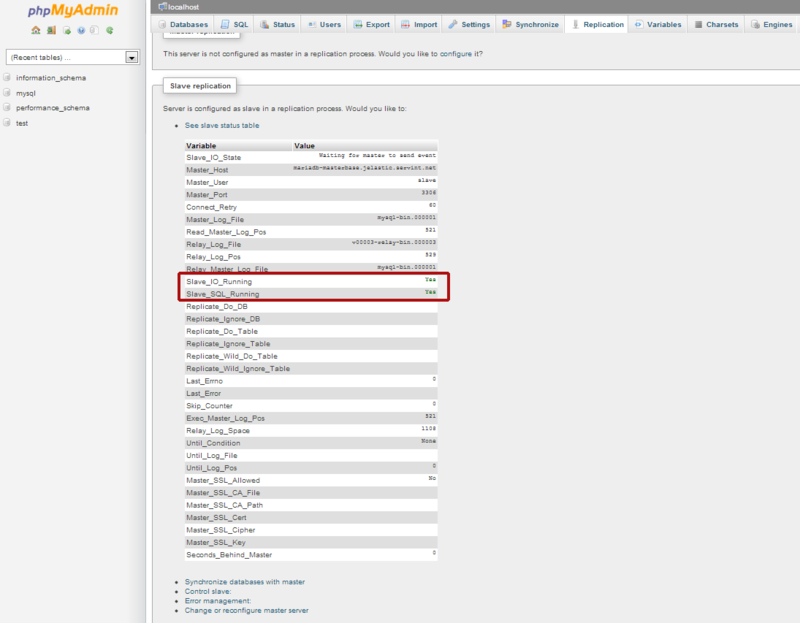 Navigate to the Replication tab and click on Add slave replication user. 6. Specify the name and password for your slave replication user and click Go. Now your slave user is successfully created. Let’s go back to the Jelastic dashboard and configure our slave base. 1. Click config button for your slave database. We allow our slave base to skip all errors from master (slave-skip-errors = all) in order not to stop normal slave operation in case of errors on master base. 3. Save the changes and restart your slave database server in order to apply the new configuration parameters. 4. Navigate to phpMyAdmin using the credentials which Jelastic sent you when you created the environment for your slave database. 5. Go to the Replication tab click configure for Slave replication. 6. Configure your master server (enter the name, the password and the host of your slave replication user). Now you master server is configured. 7. Click on Control slave -> Full start for the slave server in order to run Slave SQL and Slave IO threads. 8. Check the slave status table to ensure that everything is ok.
1. Let’s create the new database (e.g. Jelastic) in our master base. 2. Navigate to slave base and you’ll see that the new database was successfully replicated. Here are two examples on how to connect to your master and slave databases from Java and PHP application. 1. 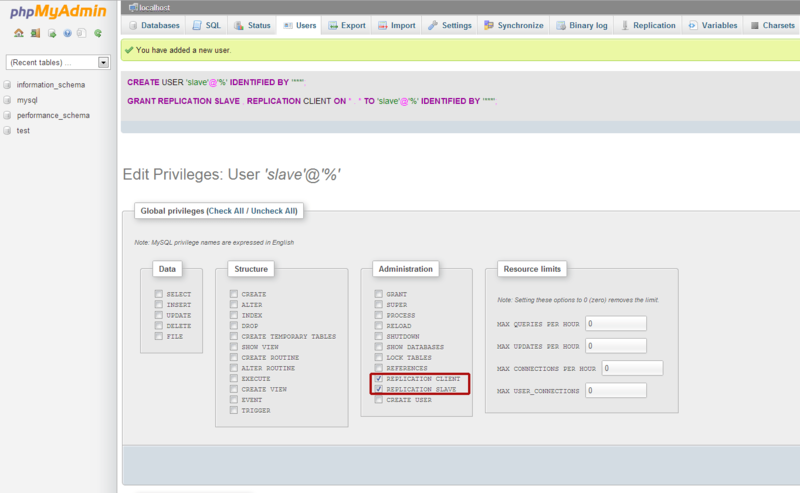 As an example here you can see the code of our Java application which connects to master and slave databases. Database replication with MariaDB adds redundancy, helps to ensure high availability, simplifies certain administrative tasks such as backups, may increase performance and much more. Now you can forget about all problems with performance, backups of different databases and system failures. It’s become easy to configure database replication in the cloud, only few minutes and everything is ready. Enjoy!